The week in a flash. The documentary film by Wes Hurley that gets inside the head and rifles through the private drawers of Waxie Moon is now in stock and ready for shipping directly into your eager little hands OVER HERE. The updated dvd version of Waxie Moon features more performance footage and extra features, and in case you missed it- Wes’s video for The Little Penguins “Shoes” was featured yesterday as a “Lunchtime Quickie” on Slog. (Since we’re on the subject of increasing your audio/visual library, I’d also recommend checking out the latest album from The Little Penguins, Shapes and Shadows, OVER HERE. As for that video…”Shoes” stars Waxie Moon, Sarah Rudinoff, Marya Sea Kaminski and Sinner Saint Burlesque’s Polly Wood. 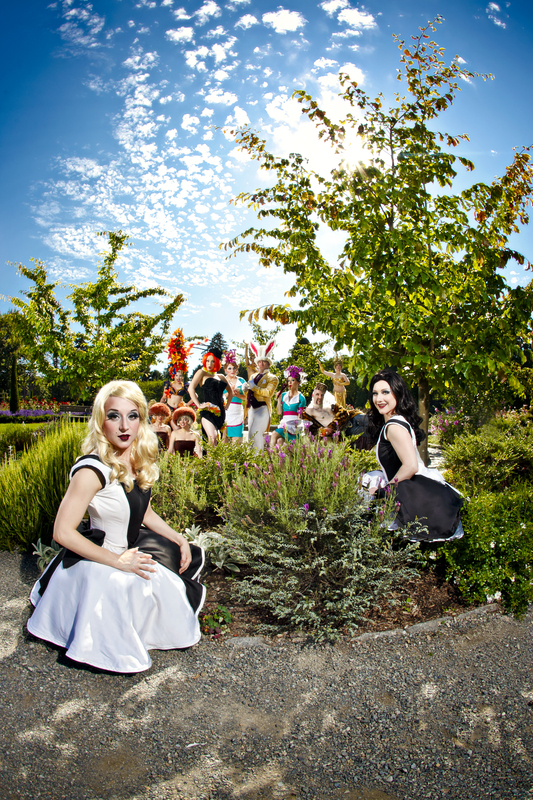 Next week, Lily Verlaine and Jasper McCann remount Through the Looking Glass: The Burlesque Alice in Wonderland (September 12-15) at The Triple Door. Get tickets HERE, and revisit my lengthy interview with Jasper himself from April 2011 OVER HERE. Meanwhile, in New York: the 10th Annual New York Burlesque Festival and 2012 Golden Pastie Awards nominations are going on now, with votes to be cast through the end of the month. Winners will be announced at the Highline Ballroom on Sunday, September 30…and where do those coveted pasties come from, you might wonder? Why from none other than the TwirlyGirl herself, Miss Indigo Blue. If you’re visiting the Big Apple later this fall, it was recently announced that Dita Von Teese will bring Burlesque: Strip Strip Hooray! to the Gramercy Theatre in NYC at the end of October. Tickets are available in a special pre-sale from Sept 4th and will be on general sale from Sept 7th via Livenation’s Dita connection. ~ by angrytruffle on 09/07/2012.